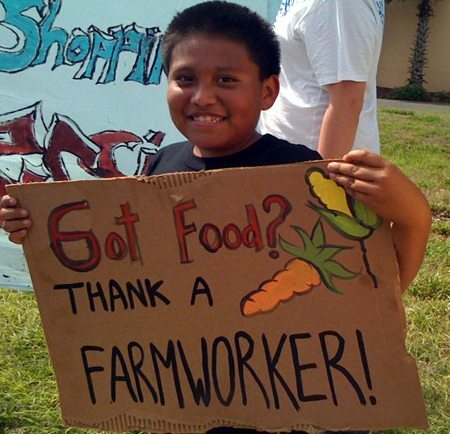 As we know, farm workers are one of the most essential parts of the food supply chain. Without their dedication and hard work, the food they produce would never reach our table. In the US, the vast majority of farm workers are undocumented and so are constantly subject to persecution, low wages and deportation. The United Farm Workers have been fighting for years for rights for undocumented farm workers to gain citizenship, but they have not yet won their fight. Raids on farm workers are happening at a faster rate than ever before and undocumented farm workers constantly live life in fear of deportation. Farm workers and their families are constantly worried that they will be next and are often targeted on the basis of their race. As hate and fear are finding footholds all over the country, now is the time to support our farm workers and farming communities. The UFW are working to educate workers about their rights and continue to campaign on behalf of undocumented farm workers in a bid to secure residency rights for these essential members of our community, some of whom have been working hard and paying taxes for over 20 years. Northern NY Bee Health Survey Results Reveal Insights Into Colony Loss.